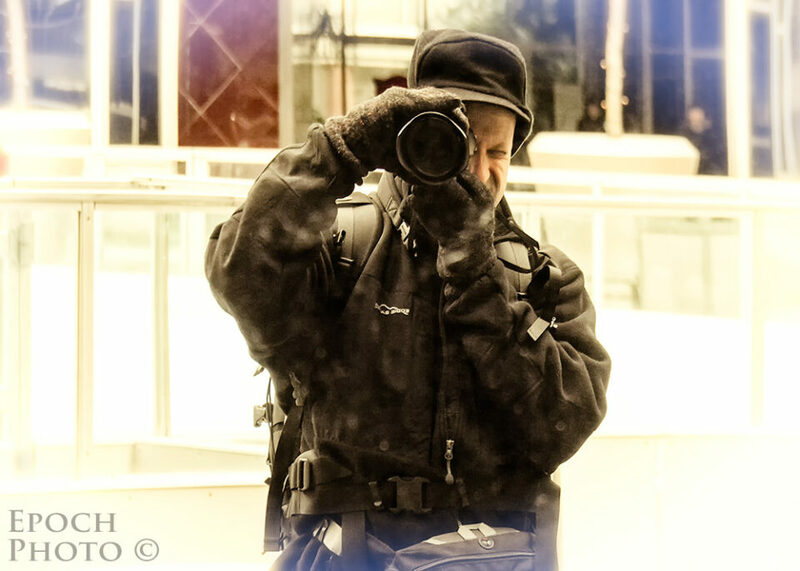 Home » Photography Business » Know Your Rights as a Photographer! It is important for you to take some time to understand the legal aspects of photography, however, since if you are engaged in the field for any appreciable length of time (particularly in the area of photojournalism), you will eventually encounter a potential legal situation. The purpose of this article is to offer some tips and guidelines that may help you better understand and deal with common issues related to your rights. All of my comments are strictly from the perspective of United States law. Since I am not a lawyer, I cannot offer legal advice (at least not legally!). Should you find yourself in a situation that calls for legal advice, attempt to find a reputable attorney (preferably recommended from a fellow photographer or organization such as the ASMP) that routinely deals with such issues. The main concern is the amount of misunderstanding regarding these issues. This applies equally to photographers, those they take pictures of, police officers and others that enforce the laws, and those that manage content, such as newspapers, magazines, and websites. Even those managing photo contests may not have the necessary depth of knowledge. This can produce quite a bit of confusion, confrontations, and unnecessary strife. 9/11 only aggravated this situation, with some in law enforcement becoming increasingly suspicious of those with professional camera equipment. 2) What Can You Photograph While on Public Land? Just about anything and anyone, and you don’t need permission. If you are standing on a public sidewalk, and spy Madonna walking into Starbucks, you are free to take her photo. If you shopping in LA, and observe the police busting Alec Baldwin for impersonating an actor, you are free to photograph Baldwin and the police arresting him, assuming you are doing so from public property. If you encounter an accident scene, there are no restrictions to your taking photos of the scene, the people involved, the EMTs, and police officers. The only areas that are off limits are military installations, TSA security checkpoints, and power generation facilities. For obvious security reasons, we don’t want to make it too easy for terrorists to observe some of the details of these facilities. And you do not have the right to photograph someone in an area in which they have a reasonable expectation of privacy, such as their home, medical facilities, etc. If you take photos of people in such situations with your 200-400mm zoom lens, be prepared to be accused of violating their privacy. You don’t have the right to plop your tripod anywhere you feel like in public. In areas, the authorities have the right to restrict your use of tripods or other types of rigs, not so much to interfere with your rights to photograph the area, but rather to ensure that you do not create a safety hazard. Most cities and public parks, such as the National Parks Service in Washington, D.C. , have published guidelines regarding the use of tripods. If you are shooting for commercial purposes, you may be required to obtain a permit and pay a fee. But if you are simply using a DSLR without a tripod, you likely have no restrictions. 3) What Can You Photograph While on Private Property? All businesses and public buildings are considered private property. Concert halls, sports stadiums, theaters, etc. usually have some restrictions on photography. As such, you need to understand the policies of each facility you enter. And don’t assume that because the IRS building in Washington, D.C. is part of our federal government, and you are a US citizen, you can simply stroll through the aisles of each floor with your DSLR and fill up your CF or SD card. You can try, but don’t call me after the fact! Most mall security guards are not going to stop you from taking a family photo in front of a mall’s fountain or the 20 foot inflatable Godzilla, but if you walk into Victoria’s Secret and start photographing the merchandise and displays, expect to be warned about their policy of not taking photos and escorted out the store by the police if you persist! 4) What Can I Publish? Just about anything you photograph that you photographed in a public area, apart from your zooming into buildings or facilities, as mentioned previously, in which people have the right to expect privacy. This is perhaps one of the most difficult issues for people to accept. I suspect if you polled a thousand people, the vast majority of them would get this wrong. It doesn’t “feel right” that someone can take a picture of some mom and her son or daughter in a public park and then publish it in a newspaper, magazine, or website. And yet, it is perfectly legal. Celebrities and politicians are another matter entirely. Since they live much of their lives in the public eye, and often owe their fame and fortunes are related to such exposure, there are few restrictions relative to photographing them. Some of the best paid photographers are paparazzi, because public simply can’t get enough photos of their favorite celebrities. Photos of a celebrity couple’s new baby can be hundreds of thousands, and perhaps even millions. Of course, some of the celebrities have wised-up – they are taking photos of their newborns and selling them directly to the grocery store tabloids for prices ranging from $3M to $11m, and cutting out the paparazzi altogether! It depends on who you are selling the photo to and for what purpose. If you are selling the photo you captured, of the beautiful young woman gazing into the sunset on the steps of the Lincoln Memorial, to an advertiser looking for a model for their new fragrance named, “Freedom”, you are going to have a problem. This is considered a “commercial” use of the woman’s image, and thus she is entitled to the compensation. She may be open to a financial arrangement, but you need to check with her first and obtain her agreement before the photo can be used. If you are taking a photo of an Occupy Wall Street crowd or a Tea Party rally, you have identifiable people in the photos, and you wish to sell them to Time magazine, you do not need to get the permission of those in the photos. Time may ask for a model release, however, if the photos have only one or two subjects. But this would be more for paranoia rather than strict legal requirements. If Time magazine is doing a story on you, and showcasing some of the beautiful senior photos you have taken, they will likely ask for a model release form indicating that the people in your photos have agreed for you to use their photos in such a capacity. Suppose you want to publish, as a “work of art”, the photo of the Washington Ballet trio you came across against the beautiful backdrop of the Tidal Basin cherry trees (on public land) during the National Cherry Blossom Festival? It is your right to do so. This applies to any photos you take of anyone in public. As long as you are not selling them for commercial purposes (e.g. used for advertising a product or service in a brochure, magazine ad, television commercial, etc. ), you are free to sell such images. This too is one of the legal issues most people struggle with, since it may seem “unfair”. And yet it is the law. Each state may have its own restrictions regarding photography taken in state parks. It is highly un-likely, however, that any state authority will take you to court should you capture and sell that once-in-a-lifetime photo of the majestic moose you encountered while hiking on vacation. It would simply be bad for tourism. If anything, they may ask you to sell them the right to them to put your photo on the cover of their “Come to Alaska” brochure! 6) Potential Sources of Trouble? Police that are not used to dealing with significant volumes of people. Some in law enforcement are not provided with sufficient training in this area, particularly those in smaller towns or rural areas. They may not necessarily have bad intentions, but there have been quite a few incidents when police mistakenly told photographers that they did not have a right to photograph either the police or other people in public settings. Police in more urban areas in high stress situations. In the middle of a confrontation, riot, or other stressful situation, police may momentarily forget the finer points of their training relative to the rights of photographers. Understandable perhaps, but it is still not legal for them to restrict your rights to take their photos and/or the scene. Security guards. If some in law enforcement are not familiar with your photography rights, there is a strong likelihood that those in the security field, that has a high turnover rate, will have even less training. Those managing photography contests, festivals, and other public-oriented events. One might expect those working for such groups to understand the laws, but I have personally encountered director level personnel in major cities, in charge of photography contests and events, that clearly did not understand the rights of photographers on public lands. Individuals and groups you may come in contact with on public property. This may be the most confrontational group of those listed. As mentioned earlier, the vast people would likely not understand that you can legally take their photo in public, and then sell it as a form of “artistic expression” on your website. And most likely believe that they have the right not to have their photo taken. Other photographers. Indeed, in the last two weeks, I encountered a professional photographer that thought I could not publish a photo taken of public entertainers, on public grounds, during one of our nation’s largest and oldest festivals, during one of the busiest days of the festival. While the photographer had indeed organized the photo shoot, they were conducting it on public grounds during a major event. In believing that they had some exclusivity to the subjects or the area, they erred on a variety of fronts (but thanks for the inspiration for this article, BTW!). And if a prominent professional can be so wrong, I have little doubt that there are plenty others in the ranks that are also misinformed. 7) How Do I Handle Confrontations With Police? First and foremost – always stay calm and be respectful. Shouting, “I know my rights, buddy, and I can take as many high res photos of you and the rest of the police state as I want!! !” is likely not going to help in a tense situation. You are welcome to give it a whirl, but I won’t be answering any of your calls to bail you out! Remember that the police have a job to do. The vast majority of them are good and decent people, with many being former veterans. 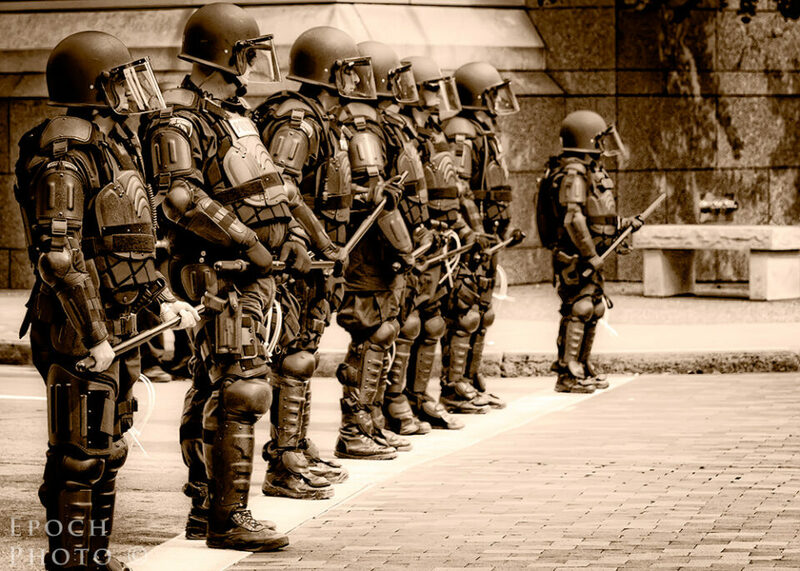 Despite the Dunking Donuts types of characterizations, each police officer may eventually be called at some point to put their lives on the line for us. As such, always show them the respect they deserve, even when they may not understand issues pertaining to your rights. That said, you don’t have to, nor should you, surrender your legal rights, should a law enforcement officer mistakenly prevent you from exercising your rights under the law. You should know our rights and always be confident in stating so. 8) Can the Police Confiscate My Equipment? No, unless you are breaking the laws or restrictions I referenced above. If they attempt to take your camera, you should, in a calm manner, ask them to inform you of the specific law or statute involved. They need a court order to seize your equipment. They “should” know this, but you may have to remind them. Again, how confident and rational you behave will likely dictate the outcome of a tense situation. Another reason to know your rights before you need to recite them to others that either don’t know or have temporarily forgotten them in the heat of the moment. 9) Can the Police Force Me to Delete My Photos? No. Even if you are in Victoria’s Secret as outlined before and acting strange. The most they can do is ask you to leave, and arrest you if you refuse to stop taking photographs in a private facility that does not allow photography. They cannot ask you to turn over your camera’s memory card either. 10) What to Do If My Rights Are About to Get Trampled On? Attempt to stop it before it happens. Always carry a notebook and pen while out taking photos, and make sure it is easily accessible. But whatever you do, don’t reach inside your jacket quickly to retrieve it during a stressful situation! If a police officer, mall cop, or other security professional attempts to detain you unnecessarily, began asking questions regarding their name, supervisor, department, reason for your detention and/or confiscation of your equipment, the specific law they believe you are breaking, etc. Make sure that he/she understands that you are going to take notes so that you clearly capture his/her responses. Some security guards have been known to offer rather vague responses such as “security concerns,” when asked what law they are citing, but that doesn’t pass the sniff test. They are obligated to inform you the specific statute they believe you are violating. If you know your rights, you will indeed have that same confidence during a stressful situation! In most cases, your calm demeanor and understanding of the law will most likely prevail, and prevent any further escalation. 11) Ok – That Didn’t Work. What’s Next? If, despite your best efforts to remain calm, avoid an escalation, and educate those involved, your rights are violated, you have legal recourse. That could include anything from approaching a newspaper, news network, or other outlet to run a story, filing charges, initiating a lawsuit, or some combination thereof. You would have to, with guidance from legal counsel, understand your options in detail, the costs involved, estimates of any settlement, the probabilities of the various outcomes, and your willingness to undertake any and all actions associated with them. Only you can make the final determination of how much time, energy, and money you wish to expend to resolve the issue to your satisfaction. Since 9/11, those in various aspects of law enforcement have become much more attuned to security threats. Unfortunately, they have sometimes turned their attention to those carrying professional camera equipment. Education regarding the rights of photographers can be spotty at best, and perhaps forgotten in stressful situations. Thus your ability to defuse a confrontation may rest in your your knowledge of your rights, skillful and confident communication of them to others, and using good judgment. Bert Krages has published an excellent summary of the rights of photographers. I suggest printing a copy, laminating it, and storing it in your camera backpack. Keep a few extra plain paper copies with you in case you need to provide one to a police officer or others involved in a potential confrontation. The simple act of handing someone a printed copy of your rights alone may help avoid a potential confrontation. If you are a member of ASMP, print out a copy of their legal section covering their legal FAQs, and review them on occasion. There are other books from Krage and others, such as Nancy E. Wolff, that cover the legal rights and specific case law regarding photography in much more detail. At all times know your rights. And should you still find yourself embroiled in a legal situation, ensure that you contact an attorney that regularly deals in these matters. If you have experienced any legal situations that may benefit others, please feel free to share them in the comments section below. techdirt www.techdirt.com/ ) covers this issue with some regularity. David Brin (a sci-fi author, davidbrin.blogspot.com/ ) talks about it a fair bit, also. Thanks, Martin. Something to think about during our adventures. A point you did not mention: These are our AMERICAN rights while on U.S. soil. Those rights do not go with us when we travel to foreign countries. Other countries will have different laws, and penalities for violation thereof. Question: What about photos of sporting events? For example, I take my camera to a MLB game, get a picture (or sequence of pictures) of a great catch, and go to sell it. Will the MLB people be all over me? My impression is yes (due to copyright of their uniforms or such). And that the same would apply to NFL, Basketball, etc. Extend the question not only to professional teams, but also college (the NCAA seems to have a lot of control over content). I believe I can take all the photos I want for personal use, just can not sell any (unless I sell them to a news source, maybe). Perhaps I wasn’t as clear as I could be – my references to US law were based on US citizens on US soil. Laws are very different abroad. Each sports stadium likely has its own unique rules, many of which technically prohibit photography. Most of the time, they simply can’t do much (and don’t care to) relative to point and shoots and/or cell phone cameras. Show up with a 300-400mm lens on a pro or serious amateur digital body, and you will likely draw the attention of one of the security personnel. I had to store my D300 and 70-300mm lens in the safe at Pittsburgh’s Heinz Field one Saturday, when upon showing up to see the University of Pittsburgh play, I was informed by the stadium personnel that “pro” camera gear was not allowed. Hi bob , I just scanned thru I must have missed the section on sporting events . So if you don’t mind , I’ll ask here . Why can they stop you from having a lens over 3 inches mine is a 70-300 zoom lens on either Nikon or Minolta body. I understand no flash, but their professional people can take pictures with bigger lenses and from great vantages . I’m in a seat with people standing and cheering . I have never sold any picture , I know they don’t know that . But I enjoy maybe getting that one awesome shot ! Nowadays people with phones get get closer with them then I can and they can video. Just tired of being turned around Thank you! A stadium is not public property, therefore, whoever owns the facility can make their own rules – “fair” or not in the eyes of others. It is not difficult to imagine someone jumping up in excitement and hitting someone’s extended lens. Given our litigious society, I can understand the stadium owner’s desire to minimize such possibilities. I feel the same way as you, but if I owned the stadium, I would make the same call. You are incorrect-if the stadium or building is paid for or supported by tax dollars, it is not private, but public property. The Richmond Coliseum, Hampton Coliseum, Norfolk Scope, etc are all public property. William & Mary Hall at the College of William & Mary is private property. State supported colleges are grey areas in terms of this distinction as they are often dependent on tax dollars, but do try to restrict certain areas of campus from the general public. According to your definition, virtually every building would be public, since I suspect every business and college has, at one time or another, benefitted from some taxpayer assistance, even if it is in the form of special tax breaks. That said, stadiums – high school, college, and professional – do indeed have the right to set policies regarding photography equipment and gear. One might imagine the havoc that would ensue if everyone brought 600mm f/4 lenses into the stadium and was bumping them into the heads of their fellow sports fans. I have what I hope is a simple straight forward scenario. It legal for me to stand on a public street in Pittsburgh, take photos of the Pittsburgh Marathoners, and sell them. Intent of selling them to the participant’s (which I’m hoping is considered non-commercial sales). Great article, I am sure knowing more definitely will help a lot of people to remain ‘calm’ in confrontational situations. I know the article describes US laws, but if I am not mistaken, I think Canadian laws are similar as well. If not, it would be much appreciated if anyone could spell out the differences. Thank you. I too would be interested in understanding the rules that those from other nations could share with the mansurov audience. I have a question. This is about cameras in a private property. Can anyone legally confiscate your equipment without a warrent? I’ve been to many minor evens during my time where I’ve heard a version of if your seen with a camera we’ll take it and kick your out or something to that effect. I know they can kick me out but do they have any right to my gear? No one can should be able to take your gear without a warrant, anymore than they have a right to take your shoes. That would be considered “theft” under most circumstances. A great site for legal information is The Photo Attorney. Thanks for recommending it, David. It is always helpful to have a few sources that one can check periodically, particularly as cases are filed/settled, laws are enacted/overturned, etc. Important piece of information by Bob…I think this piece should given an easy access link. Although it is relevant in a general context anywhere in the world, it is probably directly relevant in the US. The local laws are different; if I am not wrong, under current circumstances, I am not sure if a warrant is required to confiscate an item in the UK in public places. Thanks, Srini. Appreciate your sending along the link. This is the type of information and articles that photographers, of all level, need to know about. Great job on the article. Keep them coming. Thank you. Unfortunately, many people don’t familiarize themselves with such information until after the fact! It is probably helpful for all of us to refresh our understanding from time-to-time, and keep abreast of the latest developments in this area. You have some sensible laws and America is a nation that is built on freedom and espouses the right of people to hold itself and its society to a mirror of accountability. Photography is, of course, a form of expression and its freedom of practice within the law should be cherished and protected. Alas, the same should be true of the United Kingdom, but here police routinely confiscate the cameras and memory cards of even tourists with no explanation or reason, often just to score points for their own personal progress report. This is actually forbidden by our laws but many people aren’t fully aware of their rights enough to challenge them. More often than not, someone wearing a uniform and carrying a baton is not interested in hearing about your rights. The only other places on Earth where this routine infringement by police happens is North Korea and China. The UK is a great country and the oldest functional democracy on the planet, which is what makes it all the more abhorrent. I realise that photographers are often regarded as parasites, but then who consumes and demands all the photos they take? There needs to be a climate shift in attitudes towards them by authority, otherwise they will continue to be harassed unlawfully. This article couldn’t have a better timing. There are a lot of protests going on in Montreal and I was wondering to what extent I can photograph the crowd and the police officers using their pepper spray. I understand that the article refers to american law, but it still gives me a good idea! I am not familiar with the laws of Canada, but suspect that their are indeed websites/references similar to those in the USA, that can provide the guidelines for your rights. Good luck and be very careful! I am sorry to hear of your run-ins with the authorities and your arrest in front of your children. That had to be tough on them, not being able to understand what was happening to their dad. I am not aware of any HIPPA law that prohibits photography, but will do some additional investigation. I suspect that some are using HIPPA much in the same context as, “National Security” – a means to control citizens behavior, but without much of anything objective that they can point to to back up their claims. My wife and I are strong supporters of the police and our veterans (many of whom are in the law enforcement field). That said, we are always cognizant of the fact that power can lead to all kinds of abuses, as history clearly shows. The vast majority of police are good and decent people, and as I mentioned, can always be called on in a moment’s notice to lay their life on the line. As with any profession, however, there are always a few that tarnish the reputation of the group, and cause problems for everyone. I know it is hard to fight the tendency to view those in law enforcement in an unbiased manner, but you must make an honest attempt to do so. I am sure that you wouldn’t want all police officers to look scornfully at everyone that carries a DSLR, simply because they had a few run-ins with some obnoxious photographers. 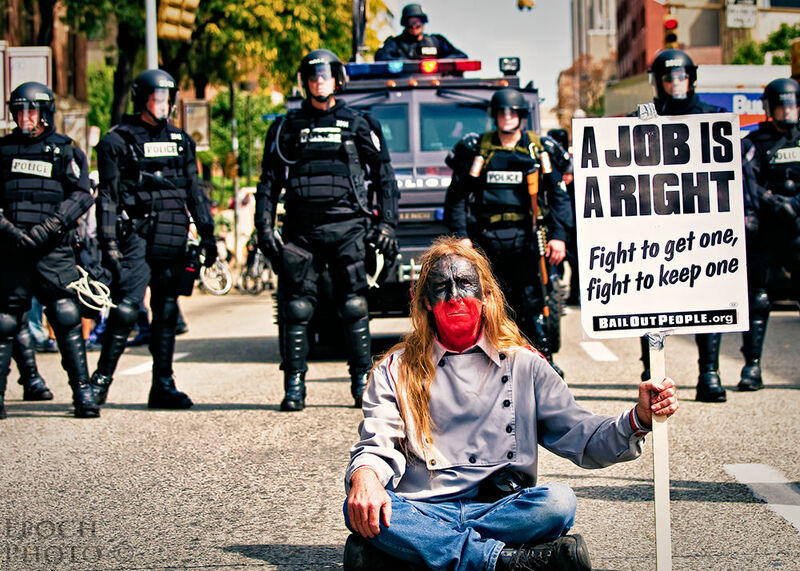 During the G20 Protest Marches in Pittsburgh in 2009, I witnessed the police display an amazing amount of restraint the extremely disrespectful, mocking displays toward them by the anarchists that took over our streets. I am pretty confident that most people would not have been able to demonstrate as much self-control in a similar situation. The police exist to uphold the laws – and that responsibility includes protecting your legal rights as well. Thanks for taking the time to share your experiences with the subscribers of mansurovs. Outstanding and necessary article, Bob. I’d like to suggest that an addendum be added. Take maybe 10 small pix of various people and places FROM various places and give us readers the opportunity to, in our own minds (e.g. not an online poll), decide which pix are examples of photos that we have a constitutional right to take and which ones violate a law. Then put the answers (as you see them) at the end. I think it might reinforce what we’ve all learned from your fine writing. Bob, nice article. I just wanted to take some time to clarify some important issues. I know you preface it with the caveat that you are not an attorney, but there are a handful of inaccuracies or suggestions of inaccuracies that I’d like to mention in case it could help someone. To clarify, if you’re on public property, you can absolutely take pictures of someone within their home. They do not have a reasonable expectation of privacy if you can see them in their home while you are on public property. So if your neighbors dance naked in their living room, and you can see them through the open window from the sidewalk, you can legally snap away. Also, “reasonable expectation of privacy” is no longer the legal standard. Anyway, thanks for the article, and thanks for letting me point out those issues. Feel free to e-mail me any time for clarifications. Thank you for clarifying these points. My commentary regarding the military, TSA, and energy facilities was from the perspective of being very close something that might be confidential in nature, but I did not explicitly state it as such. Indeed one could imagine taking a photo of a nuclear power plant from some distance without any issues, as it contains nothing that would betray any critical information. This would of course be different than aiming a high resolution camera at the controls/settings of a TSA screening machine. I suspect if we are taking photos of our neighbors dancing naked in their living rooms, we probably have other issues, but I understand your point! :) I had read some information that suggests peering into someone’s home with a high magnification lens might be considered a violation of privacy. Can you provide an examples of the public/private building issue? I had done some research and it seemed to point toward the fact that even public buildings could set their own rules, one of which might include, “no photography”. I suppose that doesn’t make them “private”, but it does mean that they can set rules that are different than being on public land such as streets and sidewalks. Any insights would be appreciated. Yes – the police can ask you anything, and as many pointed out, have done so despite the lack of a legal basis! Thanks again for taking the time to help clarify and correct some of my points. Thanks for this great and informative article! is very detailed and links to the various legislations, court cases etc that apply. Thank you for sharing some helpful links. My article was meant to foster some awareness and help spur people to familiarize themselves with the various aspects of the law. This is one of the better written articles on the subject that I have come across. I think it is important that photographers know and defend their rights. While many may not want a confrontation with authorities it is still beneficial to know when you are right and when you are wrong. There were a couple of points that I thought needed some clarification. You say that you can photograph Alec Baldwin getting arrested “assuming you are doing so from public property”. 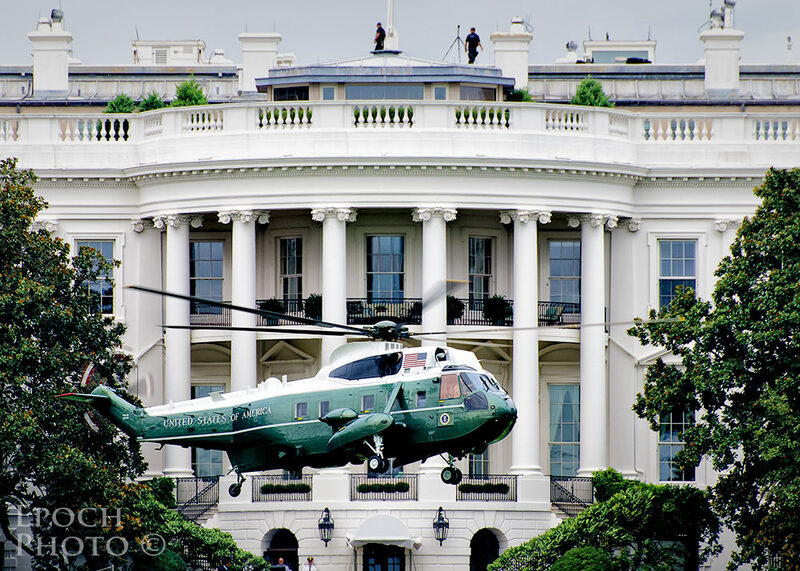 I don’t believe there is any law that states that you can not photograph in this instance if you are standing on someone’s lawn or the stairs of a building. While our rights to photograph from or on public property is pretty well known I dont think that we are precluded from shooting from many private property locations. Can I Sell My Photos – “It depends on who you are selling the photo to and for what purpose.” – We can sell our photographs to anyone we choose. We are not required to know what they are going to do with them. If a model release is needed then it is up to the end user to know that and to make sure that they have one of needed. As long as the photographer does not misrepresent the existence of a model release they would not be found liable for the end users use of the photograph. Not all commercial uses of images require a model release and there is no way possible that we can police the intended uses. In fact many photographers license their images on a website where there is no interaction with the buyer. There is no way that we could possibly know what their intent is and even if we did we should stay out of any discussion involving our opinion on whether or not a release is needed. Thank you. With respect to Baldwin, I was thinking that you could not be trespassing on private property to get that shot – slight difference in thinking about it, but I do understand your point. Someone else commented on the TSA issue. I believe there may be some limits, such as taking detailed photos of the equipment, which I might understand. Regarding the selling of photos – I cannot sell a photo I took of you to a potential advertiser. That is the situation I am describing. “Commercial” use of photography usually refers to advertising. If I sell a picture I took of you as “art”, that is my right. It is true that many people confuse ‘commercial use’ with making money. I understand that art would not be considered a commercial use even though there is an exchange of cash. There are some circumstances where an image of a person can be used commercially in an advertisement and a release would not be needed. In any circumstance it is not necessary for the photographer to know if the buyer/user of the image would need a release. You can, in fact, sell a photo you took of me to an potential advertiser. I suspect those situations are almost always ones in which there is a crowd of people and it is the scene, action, feeling associated with the photo is much more important than the specific people involved. That might not stop someone from trying to sue you, however! The company buying the right to use the photo may still want a release to avoid any types of legal or PR issues. Anyone can sue anyone at any time. I would hate to run my life thinking that a lawsuit is lurking around every corner. Hopefully we can just go about our business in a smart manner and the lawsuit will never surface. Any company may request a model release but that does not mean that you can’t sell an image without a model release. As with any good start of a legal document, I should have defined the terminology I used. By “commercial use”, I meant to promote or endorse a product. I cannot take your photo and then use it to claim that you are supportive of my new iPhone application. And while I agree in principal with your notion of not letting the notion that someone can bring a frivolous lawsuit against you, you have to be someone appreciative of the fact that some clients may simply not want to take the chance. If you do take a photo of someone and they are identifiable, they may require a model release form. So while you may be “correct”, they may simply not want to use your photo that does not include a model release for those in the photo. Different companies (and individuals) have different propensities for risk. If the goal is to sell your photo to someone, you will still need to take their concerns into account – rational or otherwise! I am a big fan of Heller. He has an excellent website and very practical advice. Hey I read a photography article that wasn’t gear reviews or techniques, yeah I am learning great stuff here. Keep up the great work, awesome information here. Try the Pinterest article. More non-review info. Thanks for the feedback. Hi, Ive spent the past 8 hours reading articles on your website at work in my white space. And I have a question loosely related to rights of photographers and models alike. If a photography take pictures of a model, and both parties have agreed that they can both keep the photos, what rights does the model have to use said photos of herself and re-distribute them for other people to edit and display etc? I have been having some issues on photographing at some dog agility events. it was a public event and we went in and took some beautiful shots of the dogs and then posted them on our website and began selling some prints. We then were contacted by the person who is with the business that hosted the agility trials (Not the owner of the arena) that asked us not to sell the photos as we did not complete a vendor agreement to ‘vend’ at the event. What are the rules/laws in that area? We have many more events coming up that we’d like to shoot at but don’t know if we should contact the owners of the facility/area or the event coordinator of each and every different event that will be hosted there. Any feedback is welcomed! Thanks for the reply, bob! But my problem isn’t the people and their dogs.. They actually love the photos and want to purchase them. It’s the person who organized the event who says that since we didnt sign a “vendor” agreement we can not sell any of the photos we took. My questions was geared toward events in places deemed public (like an arena) am I suppose to have a financial responsibility to that particular person who has paid for the space and arranged that particular event? Again thanks for your feedback!! We were also told that the county in which this particular arena is in, requires a vendor fee. Once we sell our photos, does that mean we technically have crossed the vendor “line”? Is this not public property? If so, it would not seem lawful that they could charge you for taking or selling photos of anything in the public domain. What fee did the organizer charge people with cell phone cameras? Point & shoots? I have pushed back on people claiming that I could not take/post photos of ballet dancers that were part of a photographer’s photo shoot in the middle of the DC during the Cherry Blossom festival. This lady thought she had some “exclusivity” for taking the photos in the midst of what was literally 10,000 people in DC that weekend. She was dead wrong. I suspect the dog show organizer is as well. Unfortunately, many people simply don’t understand the laws. I will find out if this arena is public or not. Thanks again, Bob for all your help!! I just found this page and found it to be of great interest. Lots of interesting information and hopefully I will learn more about my rights. Thank you for posting all of this. Regarding the animals/pets I was told by the San Diego Zoo and Safari Park that their animals are copyrighted. So you can post your images on social media but you are not allowed to sell your images and definitely not use your images for advertising. So assuming even though it is a public place they are a private organization so they can prohibit you from selling your images of all their animals? This would be different then the person who asked about photographing dogs at the event then? I also was at a historical building site in San Clemente recently and was told I wasn’t allowed to use my “fancy” camera (DSLR) only a cell phone. This came as a shock to me as I have been photographing along with many photography friends for years and no one had said anything prior. I was then told I would need a photography permit which would cost me $250.00 an hour for commercial use. I am somewhat confused on commercial use since I don’t make a living off my photography, in fact make less then their hourly rate a year. Yes, I enter competitions and yes I put my work for sale but in today’s market with so many photographers it is rare I sell anything. So what exactly is considered commercial photography? I tried looking it up and from what I can tell it would be more if you were making a living off it or selling to advertisers. But I also don’t just use my images for my personal use where no one sees them. It is getting very disheartening to me when something I love like photography I feel persecuted when I am just trying to show the beauty and uniqueness of a place. It seems lately more places are putting restrictions on photography and asking for a fee to photograph there. I totally understand if it is a portrait shoot, engagement shoot or any paid photoshoot but just taking photographs for enjoyment and hoping maybe someone might purchase your print someday doesn’t seem like the same thing. I was even told by this place their flowers on their property were copyrighted as well as the view of the city and ocean below taken from their grounds. I am just confused about why so many places are doing this, especially when they weren’t before. Is it all about the money? I long for the olden days when there wasn’t so much red tape about what you could or couldn’t photograph. You could just photograph and not worry about repercussions. Life seemed simpler then. Sorry for not getting back to you sooner. If you are someone’s private facility, you have to abide by their guidelines for the use of photography. That’s a good simple rule to go by. That could include office buildings, zoos, or just about anything else that is maintained by someone footing the bill. They have the right, just as much as you would have the right to charge people for a wedding photography shoot in your backyard. The notion of you having a “professional camera,” and not being allowed to take photos can be chalked up to ignorance on the part of the people inspecting your equipment. Before cell phones became ubiquitous, I often ran into the same situation. I had a big camera so people assumed I was going to take pictures of sporting events, concerts, etc. and sell them. I don’t run into that as much anymore, but no doubt, such mindsets still exists. If you are out in a public place, however – a beach, the streets of NYC, etc. and you take a photo of Madonna, you can indeed sell it to the National Enquirer. Despite everyone loving to hate the paparazzi, everyone is willing to buy those supermarket rags that carry their photos. And they get paid big bucks for them, which is why they risk life and limb to get them. One good photo of some celebrity and her newborn can pay for an entire suite of cameras and lenses. Commercial use of photography of that same photo of Madonna, however, is not permitted. Example: I can’t take a photo of Madonna walking down Park Avenue and sell it to an advertising agency to be on the cover of some new skin cream product. That’s not permitted. I might sell the photo of Madonna to Madonna fans on the streets of NYC, but I and some beauty products company cannot use that same image to promote products. I’m not sure much has changed since the good old days you describe. Such guidelines have always been the norm, although zoos and other such institutions may have enhanced their stipulations about getting paid if you show up at their facility, take photos of Larry the Lion, and then sell them. It’s reasonable that the zoo might want to get a cut of the proceeds. Great article. I learned much about my rights that I didn’t think I had. Though this article didn’t teach me anything I didn’t already know, it is still god too see fellow photographers learning their legal rights. As a hobby I take pictures and video of trains among many other subjects. In my town I was walking down a bicycle lane of a street since it didn’t have any sidewalks and snapped some photos of a locomotive. I was confronted by a man who didn’t identify himself, only to say that those were his trains and that I couldn’t take photos of them. I asked him if the street was his property to which he replied no. I then informed him that I have every right too photograph him and his trains from a public street. He escalated the situation and threatened to call the cops in reply I laughed and said go ahead. He gave a sarcastic laugh making fun of me and said see how you laugh in prison. I said go ahead sir you can use my cell phone to call the cops and offered him my phone. He restated that I cannot photograph his trains and I walked past him down the street and said please stop harassing me and continued to photograph the trains as I walked down the street taking a good 20 minutes to do so. The cops never came but the blowhard eventually went away. Pushing back is the only way to firmly assert you know your rights. Merely stating them will sway no one who is so closed minded to shout at other people to get their point across. P.S. I’m just a 15-year-old who takes photographs(actions,portraits,landscapes; but for personal use only, unless they will buy it and I will sell it to them) but I don’t know what type of ‘photographer I am’. By the way, I am not using pro gears. I’m using Canon 550D with the kit lens and a Canon EFS 55-250 mm lens with a 430EXII external flash and uses Manual Mode and RAW file and post processing it in Lightroom(just in case you’re asking). No one has the right to use your photographs unless you provide permission to them. There is no distinction between “amateur” and “professional” photographers with respect to legal rights. There are no tests per se. Someone might offer some certifications, but there is nothing preventing anyone from taking good photos and selling them on a part-time or full-time basis. You have the ability to put your watermark on them as well as control their distribution. The school does not have the right to reuse your photos without your permission. You can sue them, but the damages you can recover are rather limited unless you have first registered your works with the US Copyright office: www.copyright.gov/ Proving damages may be difficult. And it may not be school officials involved, but rather your fellow students working on the school newspaper. You can go back to the school and request compensation if you choose. On the other hand, the school may not wish to be on the wrong side of a public relations issue by swiping the photographs of one of its students. I doubt they will have much of a leg to stand on if they are preaching academic integrity for their students and then illegally using their photos. Hope this helps. Let me know how you make out. I have taken photographs at an annual civil war reenactment of the battles and costumed enactors. Because it was a public venue which I had to pay to enjoy, I assume I do not need permission to use the photos but want to make sure. I have a friend interested in using a couple on her self-published book cover and want to make sure it is ok.
You are fine in using the pictures in a book. The issue which would raise legal concerns is if you took a photo of a single person and then sold that image to Ford, Pepsi, etc. to be used in one of their commercials. I am in California. I worked for a salon and i also am a photographer my bos hired a photographer but asked if I would come in and take some shots,,, I was off the clock so I was not getting paid like the other photographer but she wants to use my images,,,, I was never hired to take photos ,,,and that day was clearly my day off. my question is and I think I already know the answer,,,,, can I tell her not to use the images less I get paid for them. and is there a happy medium becouse they are great images I would like to post on my websight , ????? Well, that is an interesting one. Legally, you have the right to be paid for the use of your photos if you wish and your employer (or anyone else) has no right to publish them without your permission. On the other hand, you have to weigh the priority of this issue for you. Presumably, the salon owner is promoting the business so as to get more clients, which you both benefit from. Likewise, as the owner of a private business, she has the right to tell you that you cannot take photos on her property without permission. You can indeed take photos of the outside of a building, but the property’s owner has some say in what you can do inside her establishment. This goes for the photography of both workers and patrons. These issues aren’t always so black & white. And you definitely need to consider how far you wish to “push” them given your specific situation. You could elect to charge her for use of your photos, but you need to weigh that against her posting a sign saying “no photography” and not allowing you to take photos of the environment that might benefit you as well. Your contract should be mutually beneficial. When your clients read it they should be able to clearly identify several points where their own interests are being accounted for in addition to yours. Hello..I am wondering what do I need to do if I take pictures of nature,structures and animals in a state park and county parks..do I need to get permission to sell photos as prints or on note cards as an esty online shope or trade shows? Will i get in trouble for selling? Should I copyright them as my own? I am hoping you can answer a legal question as I cannot find answers anywhere. 2 years ago I worked in tandem with a new photographer. We would each take pictures and send them to each other for editing to get another “Point of View”, which is what I call it on my social media site. I make sure that all of the pictures are properly referenced to her, explaining who took the picture and who edited it. I do not use her images in my marketing or on my website. She has now recreated her social media stuff and her new website, uses only the images that she took but I edited for some certain areas of marketing and portfolio, and I am wondering if that is legal or can I have her remove them from her site. Due to a rather personal falling out and a cease and desist letter demanding she no longer contact me for person matters, I cannot speak to her about this public matter. Advice? A joint work is created when two or more people contribute copyrightable authorship to a project with the intention that they are making one final work. Under copyright law, all of the people who create a joint work own copyright in the work together. An important concept for joint works is “copyrightable authorship.” Generally, copyrightable authorship is any creative expression fixed in a tangible form (which includes computer files, prototype sketches, etc). In contrast, an idea or concept that has not been fixed in a tangible form, for example, something that’s only been voiced orally (e.g., “let’s make the background orange” or “what if we had the image wrap around to the back of the package”) is not copyrightable. Great article. Thank you for sharing this. This is a good article. However I do not agree with a few points in it. Here is a scenarioi: I am a beautiful woman wearing a fitted superb dress and I am sitting on a bench in Central Park. A photographer takes my pictures from a distance without asking my permission. Then he makes posters using my photo and sells them. I do not consider this fair using my body to makw money. My body is my property. It must be a law that doesn’t allow this. If you are out in public, you can indeed be photographed. If your photo is used for a magazine, newspaper, article or other “news-based” content, you are fair game. If you are out in public and someone takes your photo, they can indeed sell to others for their personal use (such as hanging it their wall). What they cannot do, is take a photo of you, sell it to Coke, and have Coke use your image in an advertisement. They can not also take a photo of you in an environment that can be considered “private,” such as taking a telephoto shot of you in your living room. You may put up a legal battle against someone using your image, but if you are in a public space, be aware that your image is fair game – at least in the US of A. Other countries have different laws. We may “feel” that a law should be different, but our considerations and feelings do not influence the statue. Unless of course, we use them to change the laws. Everyone loves to rail against the notion of photographers taking photos of them in a public space (particularly whiny celebrities). Occasionally, there is a mass outpouring of rage against the paparazzi. And yet, we would all take a lesson from those dictatorships and other repressive regimes that forbid photos to hide their atrocities and crimes. We cannot have it both ways. At least in the USA, we err on the side of freedom of expression. And that includes the right to take photos of those in public spaces, whether it be private citizens or public servants. It may seem unfair, but I believe it is the best side of the fence on which to land. Great article! Love the examples and analogies. Now with aerial photography rising in popularity there is quite a lot of confusion about what airspace is permissible to fly in, and if someone owns the airspace above their house, for example. I’d like to hear your experiences with this. I know people love to bash the paparazzi, but truth be told, there would be no paparazzi f there were not customers eager and willing to buy papers to get a glimpse of [insert name of here-today-gone-tomorrow celebrity]. I suspect the laws will change to prevent us from having to worry about spying drones, although there may be many rancorous debates before arriving at any new guidelines. Great points. That’s the hardest point for people to grasp, that they don’t own the airspace above their houses. They don’t mind helicopters flying around, but they think a quadcopter is something that they somehow have the right to shoot down. Nobody ever stops to think that the cameras on a helicopter are good enough to count the tiles on someone’s backyard pool, but a quadcopter rarely carries anything but a wide-angle gopro camera that can barely make out shapes, let alone recognize people. People either understand them and love them or don’t know anything and hate them. indeed an excellent article to let the photographers know their rights. I loved to roam around streets and take shots of event that I thought interesting. unfortunately not all of us live in a society with high law and order situation and some live in area where law enforcers are feared rather than being relied on to uphold the law and order. recently I took a photograph of a police officer taking rest on the sidewalk with his fellow officers, although both of us were on public property and perfectly in view of each other; I was confronted by their incharge and was told taking photograph of police is illegal and taking photo without permission is even bigger offense. my camera was confiscated (even after I offered to delete the photo), I was detained. only after intervention of one of my friend who is a police officer I was released, on condition that my employer co-sign a bond stating I shall not take photo of police officer in the future else I will be imprisoned for full extent of law. sadly even though I am searching hard I cant find any law in our country that makes photography without permission illegal or taking photograph of police officer an offense. the experience has took slight toll on my self esteem and now a days I no longer find it fun to take on the street and shoot. Thank you for your sharing your story. Sorry to hear of your plight. Where do you live? Hi! I trying to get into stock photography and am still trying to make sense of what I am and am not allowed to do. If I took photos within public parks (city or national) and no one else is in it, could I sell them for commercial use? What about public landmarks, such as the Golden Gate bridge? If a particular subject is trademarked (as is the case with the Golden Gate Bridge), the licensee (person purchasing the right to use your stock image) does need to seek permission to use it for commercial purposes such as advertising a car, travel agency, etc. Why? Should someone take a terrible picture of it and associate it with a disreputable product or service, the city of San Francisco would not want that negative image to rub off on their tourism business. If you wish to take photos of the San Francisco bridge and sell them as your own works of art – on paper, t-shirts, etc, you are free to do so. You need to check with each of the subjects you are considering photographing to determine what its copyrights, trademarks, etc. to know what you can/can not do with a photo, as well as what terms you need to consider when advising those that might license your pictures. Police civilian employee here. It is worth keeping in mind that, these days, many police officers feel like they are at risk. We’ve had incidents of known police haters hanging around outside our HQ photographing people coming and going through the employee entrance. Photographing one of our officers will put that officer on edge. That does not give the office the right to abrogate your rights. However, a little sensitivity and tact on the part of the photographer (e.g. asking “may I take your photo?”) would go a long way to avoiding unpleasantness. 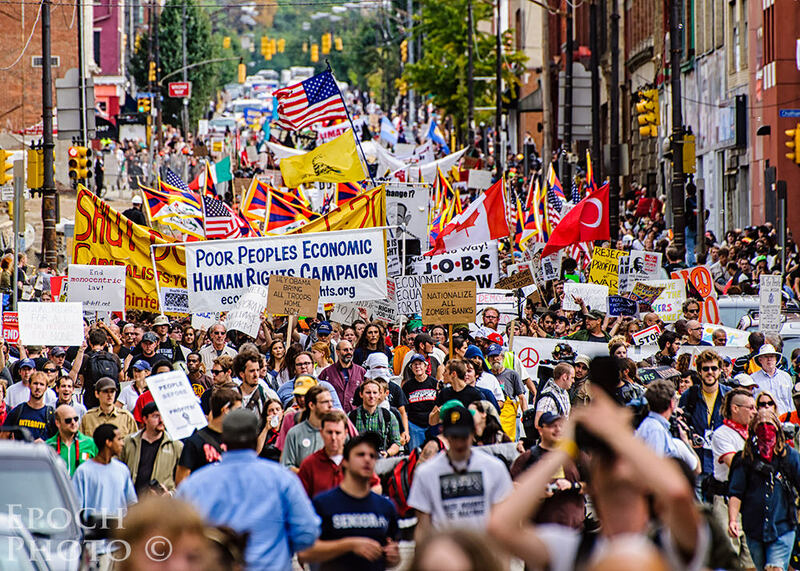 I took photos of the G20 Summit in Pittsburgh in 2009. I found the behavior of the crowd appalling. “Obnoxious” didn’t begin to describe the way some behaved toward law enforcement. Many people were being disrespectful to law enforcement officials for no reason other than they thought they could get away with it, and they had an audience. Here’s the problem: Without some form of safeguards, there is always the potential for abuse. Those who have documented abuses by the police and others in our government helped forge much-needed reforms. And the $64,000 question: What officer engaging in violating someone’s rights do you suppose would have acquiesced to a request to photograph his/her behavior? I really appreciate your article! I am a hobby photographer that took pictures at a public school competition of students performing last year. I am starting again this year as it is that season once more. I pay to get in. I sit in the spectators section like everyone else. I take pictures of each school that performs. Last year I posted them for sale and had no problems. In fact, many students loved them and commented about the quality. I didnt sell many at all, but I figured that would improve with time. Although the event is held at a public high school, the organization that put the event together contacted me and asked me to stop. They said the school staff (registered members of their organization) signed photo releases for exclusive rights to images at all of our events. But, I’m not a staff member or a member of their organization. I’m just a spectator taking pictures. They do have an official event photographer that advertises at the event. No signs are posted that state you can’t video or take pictures. Prior to their message, I had the photos for sale for both personal and commercial prices. After poking around, I removed the commercial price altogether as now I believe that wasn’t legal. I do not want to do anything illegal. I will gladly do what is correct, but I do want to know my rights before I pull down all my pictures. Hello, I have a question concerning my rights as a photographer on Facebook. I have a photography page. 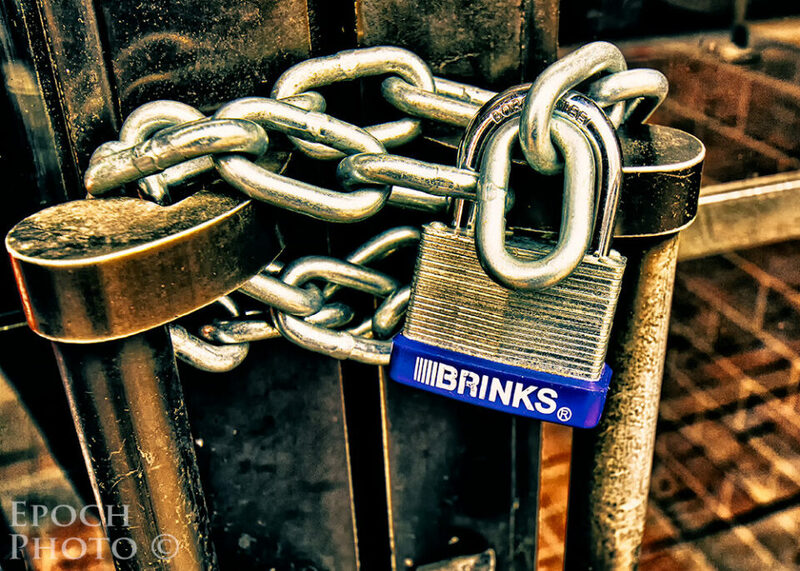 When I post, all my photos have a watermark on them. Recently someone has started cropping and editing my photos. He says once I post them to social media I lose my rights to them and he can do what he wants. He is correct? What are my rights in this situation? If this person (you referenced) has some arrangement with the social media site you posted your photos to, they (the social media company) can indeed give them the right to use your photos as they (the person receiving the photos) sees fit. If that was included in the social media site’s T&Cs, the person in question be correct. That does not mean everyone who finds your photo can do anything they wish with it, however, any more than finding your car parked on the street allows some thief to claim it as his. If the photo in question was not distributed to someone based on YOUR first assigning such rights (when you click those buttons containing legalize that everyone ignores), that person (claiming that you gave up your rights) has no right to your photo, despite what he says. If someone simply came across your photo and swiped it without your permission, and without getting it from someone (such as Facebook) who had assigned the right to use that photo to them (based on your agreeing to the social media’s T&Cs), they don’t have legal access to it and are in potential violation of your copyright. With the rise of the internet and a generation now having grown up accessing just about anything and everything for free, there is a rather widespread misconception that anything anyone comes across on the internet is either “free” or should be free. If you read some of the comments on this post, you will see what I mean. These young Marxists believe in the so-called “finders/keepers” rule. You could contact an attorney if you choose and determine whether he/she believes you have enough facts to sue for your rights under the copyright laws. Of course, the problem with such laws should be rather obvious: the person you sue needs to have some means by which to pay. Unfortunately, most of those committing such copyright violations are probably also the ones least likely to be able to afford any kind of settlement. Many serious amateurs photographers have dreamlike fantasies that some major corporation will heist their photos without our express written consent and use it in a major advertising campaign, allowing them to sue for gazillions. But alas, large corporations and businesses in general, usually steer clear of trying to save a few dollars by swiping someone’s photo and risk a lawsuit and/or damage to their reputation. It’s just not worth the risk to them. It does happen on rare occasions, but it is not very likely. The average guy or gal who thinks everything they come across on the internet is free? They pilfer with wild abandonment, either not realizing the error of their ways or continuing to do so because they realize no one is going to bother coming after them due to their (the thief) lack of resources. Certain physical structures, such as the Golden Gate Bridge and the Transamerica building in San Francisco happen to be registered trademarks. And, they have been infringed upon inappropriately in the past, but these were cases that have nothing whatsoever to do with photography. And at the time, news of these suits briefly caused publishers to shy away from publishing photos of such places unless photographers could provide property releases for them. Those releases were not for the buildings, but for the right to use the trademarks. This was very short-lived, however, because it is impossible for photographers to obtain “true” (and legally valid) property releases for trademarks without paying enormous sums of money. So, even though the publishers stopped asking for those releases, the rumor perpetuated nonetheless: photographers erroneously interpreted these requests as “mandates” that all photos of buildings required “property releases.” And they’ve been behaving that way ever since. This morning I went out and took an image of an building. A I was never on the property of the building owner, and was in the middle of street own by the city at 0617. The security guard came out after I took a few images and told me I wasn’t authorize to take pictures of the building. If you are close to home or your car and asked to leave do so, not to increase the situation worst. Then attempt to walk back there asked for the property management information from the security guard as well their name. If they refuse on both counts like in my situation. I’ve email the property management myself and express to them want had occur. I had received an reply already and the matter will take care of itself. Your camera, type of lens used the fact each image has an date time stamped in image will assist you in your position of right and wrong situations. First, thanks for posting the article. I’ve taken photos for years at public sporting events (mostly running events), and given them away. I’ve just started selling the photos, and hit my first apparent road block. Just got a call from the event race director, telling me what I did was illegal (taking/selling photos of participants in the race). I have no idea what legal ground I stand on. I would think my senerio/case is a black/white issue, it’s clearly legal or not. 1. The events I shoot are always on public land, or in state parks. 2. I never include any info on the photo (no event title, no event logo). It’s just a plain photo. 3. I make the photos available to the public for sale. With the intent of the runner in the photo, be the one who purchases it. I do not use/sell the photos for any commercial use. My only concern is, that the runners are wearing BIBs that have the race info (name) and logo on it. But sure from a non-commercial standpoint if it’s legal for me to sell the photos without the events permission. Again, very simple clear case, hopefully the law is simple and clear cut. Example: I take a photo of a runner in the New York marathon, the photo clearly shows the runner’s BIB (a BIB is a piece of paper attached to the runner showing their race number identification as well as event name and logo), and sell that photo for non-commercial use. Legal or not? The event takes place on public land so I believe you have a right to take a photo of those in the scene and sell them to individuals. The issue, as you alluded to, arises when you sell someone else’s picture to an advertiser without their permission. Some of our parks have been pushing to charge photographers if they sold photos taken in the parks, but I believe there was a good deal of push back on this one. Beyond the absurdity of the concept was the practicality of enforcing such a law. I have been to a famous beach club and I took a pic of the sunbeds during the sunset. no logo of the club, no people, just sunbeds and sunset. I would like to use it for a cover for a lounge/chillout compilation and distribute it on spotify/itunes etc etc. Am I allowed to do it? Thanks to everyone. If it is a privately owned business, I suspect the official answer is “no,” although in practice, the beach club may not care. You can easily call them and find out what their policies/perspective is toward people using pictures taken on their property. If you have to be on their property to take such a picture, they have some say in whether it may be used for commercial purposes, even if, in the case of Spotify or iTunes, you may not be benefitting commercially. Would you be able to elaborate on what is allowed in real estate photography. Can portions of a neighbor’s house or vehicle be present in the photo that would be used in an OLD or other real estate website. My realtor doesn’t want to use photos that include these things, but it limits the scope of the photo (not able to take photos from certain angles of front yard not backyard). If our photographer is on our property, is it okay to use those photos with the neighbor’s house/ vehicle or yard ? I enjoyed reading this article thoroughly. The subject is soo different from conventional articles and really really useful to know what are your right and what you should not do as a photographer.